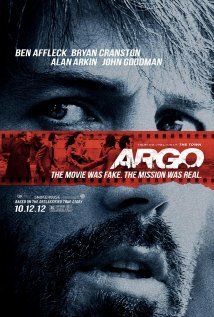 For anyone who may be on the fence about shelling out $10.50 for a ticket to Argo, let me just assure you that you will not be disappointed. I am not just saying this because of my infatuation with political thriller movies or with Ben Affleck, but Affleck proves, yet again, that he has certainly got a knack for directing. The plot, based on the true story of the unusual rescue of six Americans during the 1979 Iranian hostage crisis, keeps the audience engaged right from the beginning. Affleck plays the role of Tony Mendez, the CIA operative who spearheaded the creative plan to rescue the hostages from the Canadian ambassador’s home in Tehran. The casting of Alan Arkin and John Goodman as two Hollywood professionals helping to create the fake movie that brings the hostages home provides the perfect amount of comic relief in an otherwise humorless situation. Sporting the true late 1970s style of feathered hair and polyester suits, the cast successfully takes the audience back to 1979 and 1980 to experience the suspenseful events surrounding the little-known rescue of the six hostages. For me, what made this film so interesting was its focus on the six American hostages. While the movie begins with scenes of the Iranians protesting outside of, and then storming the U.S. Embassy, the true focus is on the story of the six Americans hiding out in the Canadian ambassador’s home. It shows a different aspect of a crisis we have all studied. It can be difficult to keep an audience in suspense when the ending of the story is already known, but Argo successfully keeps you engaged and eagerly waiting to see how the hostages make it home. At the heart of the movie is the notion of international cooperation and diplomacy, and the benefits of both. This mission could not have moved forward or ended in success without the critical aid of Canada, which Affleck understands and illustrates in the film. While the film does not depict exactly what happened during the course of these events (it is a Hollywood movie after all), it is an entertaining and dramatized look at a once classified operation. Ultimately, this is a very enjoyable film for anyone interested in politics and international affairs, history, or Ben Affleck.